This spring I had the pleasure of joining a group of entrepreneurs, artists and influencers at a Kit and Ace Supper Club in the Fishtown neighborhood of Philadelphia. Kit and Ace is a new company from the son and wife of Lululemon's founder that is bringing the comfort of workout clothes to everyday wardrobes and employing techinical fabrics to also make the athleisurewear easy care. Their Supper Clubs, held monthly in each store, connect with the creative community in a fresh way, and the format of the dinner is one that could freshen how you host an event in your own home. While the Kit and Ace team aimed for synergistic combinations in their guest list, this was not a "networking dinner" by any means. Instead of small talk, the focus of the dinner was Real Talk. We started off with a champagne toast, then gathered around a square table for 12 at the front of the store. The table was large enough to accommodate but close enough to feel connected to everyone. We were asked to keep side conversations to a minimum. Instead conversation for the group was guided by Real Talk cards, which we read roughly in turn and which sparked conversation that became increasingly deep, funny and quite real. A private chef served several courses of food, introducing each so that the meal became part of the conversation as well. I won't tell you what was talked about -- what happens in Supper Club stays in Supper Club -- but I will say that at the end I felt like I had a new group of friends plus fresh party ideas to share with you. Cheers! Mix up the guest list. Invite people who do not know each other but have a common thread. Real Talk. 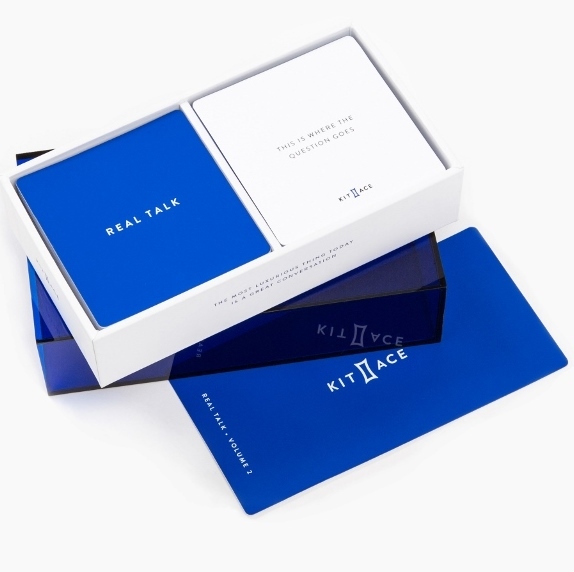 Kit and Ace's boxed sets offer conversation starters that provoke more than the usual small talk amongst strangers. Let the conversation flow. While our hostess made sure each of us read a question at some point during the evening, she let the conversation flow naturally and develop its own rhythm.